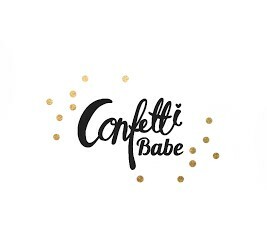 Confetti Babe: Hello from Brittney & Kendalynn! Hello everyone! Just wanted to stop by and say hi and introduce myself and my little girl, Kendalynn. I am a twenty something year old stay at home mom who blogs, and I'm working on becoming a work at home mom. I plan to open up a children's clothing and accessories store and re-open my blog design shop! We live in Houston with my amazing husband, but we're originally from Austin, Texas. Kendalynn is almost 5 months old (OMG how does time go by so fast now?!) and I blog about my crazy adventures with her! I am new to this mom thing and I love connecting with other moms. Kendalynn has modeled for some online shops and I love to host giveaways. The thing I'm most passionate about, other than baby fashion and graphic design, is helping others and giving them an opportunity to win something. Hint: Go to safari on your iPhone or iPad and save it to use on those devices, too!